There isn’t anything in our terms and conditions that you wouldn’t expect to find, or that isn’t good common sense. Your privacy, permission and data protection is very important to us, so please take a few moments to scroll down and check you’re happy with these. We have tried to explain things clearly, so a quick glance is all we need, and more importantly, it means we can start our relationship with you in the right way. We are Intelligent Transport, published by Russell Publishing Ltd., registered company (England) number 2709148. Our home and registered office is: Court Lodge, Hogtrough Hill, Brasted, Kent, TN16 1NU, United Kingdom. It’s great to see you on our website, and whether you are here to subscribe free to our publication, or are simply using our site to find out the latest news and analysis, by accessing www.intelligenttransport.com you agree to the following terms and conditions. By ‘you’ we mean both you as an individual, eager to learn from us, and your company if you are looking as part of your work. If you don’t agree to anything you read below, or don’t have the authority to agree on behalf of your company, then you should stop reading and try and find high-quality data elsewhere (though in our view, it will be hard to find anything as good as our content, but good luck!). If you have any questions about these terms or what we do, please contact [email protected] – we are happy to help. Intelligent Transport is one of the leading sources of news, analysis, products, services and learning communities in the industry. We publish content every day on our website, or as digital documents in a range of easy-to use formats, such as PDFs and graphics, or as high-quality print periodicals. We are passionate about delivering great content that is relevant to our readers. Our content is currently free when you fill in a simple form asking for basic details and your interests and contact preferences. All the information we ask for is used to make sure we only send you relevant content. We do not ask you for any credit card or payment details when you subscribe – when we say it’s free, we mean it. However, from time to time we may notify you of a special paid-for report, event or product, and only then will we ask for payment, if they are of interest to you. Just so you know, we have no plans to make our content paid-for, but we do reserve the right to cancel the free access at any time. We will tell you in advance, and again, because we don’t ask for any payment details upfront, you don’t have to worry. 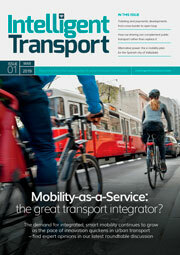 A number of our readers, such as research libraries, government bodies and large corporates do pay for a subscription to Intelligent Transport to ensure they receive copies and online access. They like what we do so much. If you would like to know more about purchasing a subscription to guarantee you get your information, please contact [email protected] for pricing and order details. After all the work we’ve put in, we retain the copyright to any material on this site – including the text, graphics, code, design and software. If you wish to use any of our work, please ask us first – although you’re welcome to download or print a single copy of anything for your own non-commercial use. Just don’t use it elsewhere without our permission, please. When you subscribe, you will be given your own online account to access our content and restricted website pages. Your password is yours alone – please keep it safe and do not let anyone else use your account. Your account is linked to your email address so if you lose your password you can request a reset link or contact us for help. If anyone else does use your login details – though why pass these on to colleagues as they can subscribe free just as easily as you have? – please let us know immediately. Remember, your account allows you to post comments and be a part of our online community – don’t risk other people’s views appearing as yours. We hope you make the most of your online account to explore our pages and find new opportunities. It is what you make it, so please make full use of it and contribute generously. Whether you decide to subscribe or not, we want to make it clear that any use of our website is at your own risk. Neither we, nor any of the other companies we work with to run this website, can be held liable for any damages you may incur when using it. This includes any form of download or electronic transfer of data from the site, and you agree that our content is not intended as any kind of official advice, guidance or legal representation. We will, however, be happy to help resolve any issues in any way we can, just as we’re here to support you when things are going well. Similarly, there are a lot of external links to useful sites on our website. If there are any links to sites that are not useful, or are inappropriate or harmful in any way, we do not accept responsibility for them – but please let us know immediately and we will remove the links asap. Please remember to check the privacy policies and terms and conditions of use of any third party website as these will not be the same as for this site. And while we maintain vigilance and up-to-date security, we cannot guarantee that viruses or other tech nasties will not happen, or that the site will be online and working perfectly 100% of the time. If anything does break, please flag it up and bear with us while we fix it. We will try to schedule routine maintenance outside peak working hours and alert you to such maintenance on the website. Intelligent Transport takes privacy and data protection seriously, and we get upset too when we see other companies abusing trust – so we aim to be clear and upfront with our users from the start. Even though our quality content is provided free of charge, to deliver it requires a dedicated team of professionals using cutting-edge technologies and systems. These are, sadly, not free. So, our business depends on working in partnership with a range of third party organisations, each of which pay a fee to promote their relevant products and services on our website, digitally or in print. We are not going to apologise for this. Intelligent Transport’s purpose is to act as a voice for the industry, and we feel strongly that our advertisers have something of value and interest to say to our users. We like making connections and helping people to discover new solutions as well as to learn and hear about the latest developments from all areas of the industry. While we work with third parties, you stay in control at all times. Intelligent Transport will never sell or pass your data to any third party without your express permission. When you complete our simple subscription form or if you go to download any materials from the site you can decide if you are happy to be contacted by a third party or not. You have the control to select whether you want to receive emails from us, and which ones, through a preference centre, and you can unsubscribe at any time. Only where you have agreed to be contacted by an advertiser when you download any third party content will we share your information with them, because you asked us to. Many of our advertisers are just as forward thinking as we are, and with new data protection regulations (such as GDPR), they wouldn’t work with us if we didn’t meet these high standards. All we ask our users is to remember that our advertisers are a key part of enabling Intelligent Transport to do what we do, so please consider what they have to say and give their products some thought when browsing online or print. Better still, let them know you found them through us, we would be very grateful! – Take measures from restricting you and others from your organisation from using the site. These terms and conditions, and all matters arising from it, shall be governed by and construed according to the laws of England and Wales and shall be subject to the exclusive jurisdiction of the courts of England and Wales.